Changing Lives Books 1 & 2 compiled by Pete Cossey (ISBN 978-0-9864508-0-8 & 978-0-9864508-1-5) NZ$22.95 rrp each. Two excellent anthologies that bring together exciting missionary stories and provide an invaluable guide to some of the world’s most respected mission agencies. In the Desert Seasons of the Heart by Nola Mickan (ISBN 0-620-31492-3) NZ$24.95 rrp. New to Castle. An inspirational book written while Nola served as a missionary in Chile. This book is beautifully written and presented, full of stories and encouragement to help people through the hard times. Two Lives, One Dream by Nancy McBride (ISBN 978-0-473-14316-9) NZ$22.95 rrp. An excellent book in the fine tradition of missionary biographies. The heartfelt and fascinating story of a couple working with Wycliffe Bible Translators in the jungles of Papua New Guinea. The Spiritual Significance of Music edited by Justin St Vincent (ISBN 978-0-473-15690-9) NZ$29.95 rrp. The book everyone is talking about. An anthology of Christian and non-Christian musicians and authors talking about what music means to them from a spiritual perspective. Featuring Delirious?, Faith No More, Michael Franti, Guns n Roses, Kevin Max, Petra, Ravi Shankar, Underoath and more. 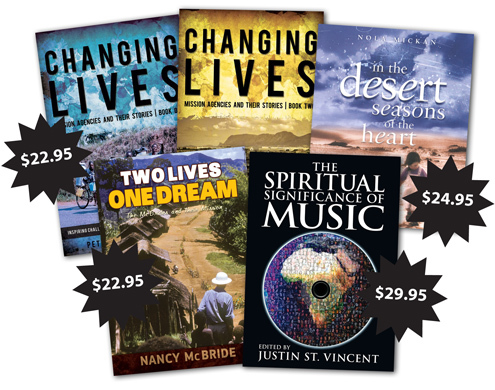 All great quality books with a positive message – brought to you by New Zealand’s premiere Christian publishing house. Contact us for more info or to order a copy. Click here for info about ordering online or from a bookshop. Posted by Andrew Killick (Publishing Manager) in 4. Castle Distributed Books, Spiritual Significance of Music.